When connecting for different display source, the projector needs to be set to corresponding signal source. Besides, Android phone needs a MHL cable to connect the projector while iPhone needs a original digital AV adapter. This compact projector will project on a big screen!The minimum recommended viewing screen size is 32 inches and the maximum recommended screen size is 120 inches.Control the size of the picture on your projection screen by moving the screen or projector. For example, for a 120 screen, the projection distance would be 3-meters away.The recommended screen size is 49-80 inches and the bestprojection distance is 1.5-2 meters. With advanced smart lamp care, save energy as high as 70% for 20000 hours of life. The projector includes a 5V0.5A USB charging port. 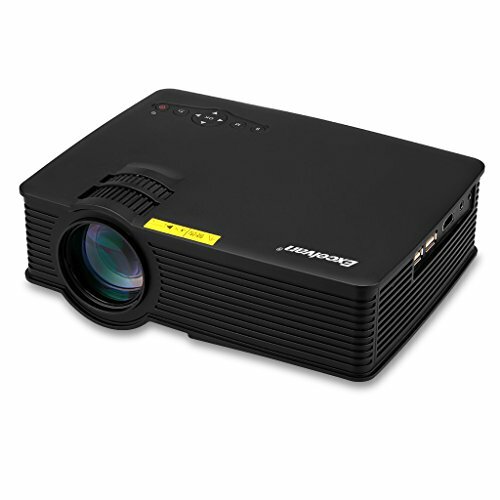 Updated 2017 mini projector with high fidelity images, enhanced image focusing function; you can easily adjust the lens to focus for a clearer picture and text. The 1200 lumens (90 ASIN) LED light source / 800 x 480 high definition/ 1000:1 contrast will easily show a clear picture from 1 to 3 meters away. With this quality, you will have a home cinema experience with crystal clear images! FAN SOUND SYSTEM - A new generation projector equipped with an innovative cooling system with heat dispersion, as well as the fan sound cut in half with noise suppression. PORTABLE DESIGN -The mini projector is compact measuring at 8.1" x 6.6" x 3.0" or 208mm x 168.3mm x 78mm. The mini projector is suitable for travelling, camping, outdoor parties, family gatherings and more! Now, you can easily share your pictures and videos easily with this mini portable projector. MULTI-FUNCTION INPUT- Built-in speakers, AV/VGA/USB/SD/HDMI interface and can connect to the projector with your iPhone, Android,Mac, PC, laptop, DVD, U-Disk/Hard Disk Device, or TV set-top box(STB) and with the 5V-OUTPUT USB PORT power charge your smartphone and tablet. LEADING INDUSTRY WARRANTY - Warranty is 1-year on limited parts and labor, 90-days on lamp and free 1st year replacement.NOTICE: Mini portable projector is not recommended for PPT or business presentations, it is most ideal for home theater movies and video game use only.